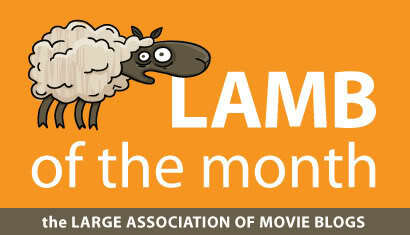 The Large Association of Movie Blogs | LOTM (LAMB of the Month) March! Its no surprise to anyone that follows David that he does a great job covering the Oscars to the extent that at least I based a lot of my oscar pool bets from his reports but beside that he also does a great work on the new LAMB welcoming committee. The committees main goal is to make the transition into the LAMB easier for new LAMBs and we are still working out the guidelines for it but I think its a great service that will help newbies become more LAMB involved from the get go. Finally, I’d like to highlight some of his brilliant writing also with this excellent piece on the differences between Sound Editing and Sound Mixing. Since NTEMP also is the current top dog on the LAMBoard I’m already following him on twitter for this upcoming month so beside him I’ll also be following the LAMBoard runner-up @denkosky. The podcast episode of the month comes from Ryan Mcneil‘s newly started In Between Days series. In episode three he met up with Shirley Hughes and Chris Edwards from the Toronto Silent Film Festival and had a very good conversation about silent films both looking at it from an historical standpoint but also with the recent trend of the Artist and Hugo. On these posts I’ll also compile a leader board of new lamb referrals, it will be based from the new lambs I’ve been adding and onward. Thats all for now, don’t forget to vote on the poll in the left sidebar if you haven’t already! 8 Responses to LOTM (LAMB of the Month) March! Thanks Joel and all for your kind words. I was just off to welcome some new lambs when I found this! Congrats NTEMP on being the blog of the month. Great job. Congrats NTEMP!! A very well deserved honor. Awwwww, congrats NTEMP! Well deserved.